THE CRIMINAL ASSETS Bureau (CAB) has seized a substantial amount of cash and property from a family suspected of extorting elderly and vulnerable people in Cork. Cash to the value of €31,500, ten vehicles, and four Rolex watches were among the assets seized in a joint operation carried out in conjunction with several garda units this morning. The investigation is focused on an organised crime gang made up of members of an extended family based in Cork, who gardaí say are involved in fraud, theft, deception, extortion, burglaries and in the sale and supply of drugs. Investigators say the gang use paving, gardening and landscaping businesses to target elderly and vulnerable people to deceive them of money. They are suspected of using intimidation to instil fear into their victims and to charge them exorbitant rates for substandard work. Gardaí say they are also suspected of extorting large sums of cash from elderly and vulnerable people for unnecessary work and engage in theft and burglary in the areas where they carry out work. 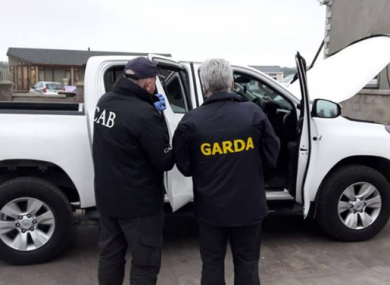 11 searches in total were carried out under warrant against the gang, including seven on residential premises, one on a plot of land, and three on professional premises in Co Cork. The vehicles included a 181 Toyota HI Lux, a Toyota Hi Lux with a 2015 UK registration, a 191 Toyota Landcruiser, a 181 Ford Focus Sport, a 191 Ford Focus, a 172 Ford Transit pickup 172, and a 162 Kia. Documents in relation to the ownership of the seized assets, as well as financial documentation, mobile phones and electronic storage devices, are currently being examined by CAB experts. Detective chief superintendent Pat Clavin said that the search operation is a “significant development” in CAB’s investigation and is viewed as a major disruption to the activities of the gang. Email “CAB seizes €31k, vehicles and Rolex watches in sting on family suspected of extorting elderly people”. Feedback on “CAB seizes €31k, vehicles and Rolex watches in sting on family suspected of extorting elderly people”.